At times when you do not have an opportunity to buy specialized ferret food, you can settle for the best cat food for ferrets. Out of all kinds of pet food, this is the one that suits ferrets the most. When making a decision about what to feed your pet it would be good to know the basic facts about ferret diet. Can ferrets eat cat food? Is cat food good for ferrets? Ferrets were domesticated not long ago and their eating habits haven’t changed since. Both wild and pet ferrets are strict carnivores. Their daily nutrition consists mostly of proteins and fat with very little carbohydrates and fibers. Cats have a different digestive system and their food can contain plant-based products. High-quality cat food is higher in proteins, so you can feed your ferret such food occasionally or mix it with specialized ferret food or raw meat. You should always read nutrition information on a package very carefully and make sure that cat food contains at least 36% of proteins and no more than 3% of fibers. Now, let’s see what kinds of cat food might be suitable for your ferret. What kind of cat food can I feed my ferret? Can ferrets eat wet cat food? Can ferrets eat kitten food? 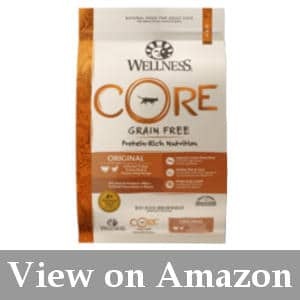 The Wellness Core cat food can be good for ferrets because it does not contain grains. Grains (especially corn) are highly undesirable in a ferret diet. This cat food contains not less than 45% of proteins and not less than 18% of fat. Carbohydrate content is less than 3%, which is quite acceptable. As you can see, the ingredients are completely permissible for feeding ferrets. The bag cannot be sealed tightly, so if it stays open for too long, the content might become rancid. The Orijen dry kiddle food is formulated for grown-up cats and kittens. In general, kitten food is more suitable for ferrets, so this product might be preferable over others. Meat (chicken and turkey), fish and eggs constitute 90 percent of the formula. Fiber content is minimal, while grains and potatoes are excluded from the formula completely. The new recently changed formula is not as good as the original one. The formula of the Petcurean Go Fit and Free cat food is based on chicken, turkey and duck meat. It does not contain any meat by-products and grains. However, this food contains peas, some vegetables, and fruits, which is fine for cats but might be not good for ferrets if consumed in large quantities and very often. But the big plus is that according to the guaranteed analysis, the fiber content is quite low – no more than 1.6%. Enriched with Omega fatty acids. Contains peas, fruits, and vegetables. 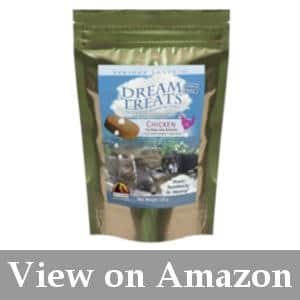 The Wysong Dream treats are suitable for cats, dogs and ferrets. These are freeze-dried treats, which contain 46% of animal-based protein, including chicken meat, organs and bones. The product also contains some fruits and vegetables, such as blueberries, broccoli, plums, carrots, etc. The total amount of crude fiber does not exceed 0.5%, which is quite healthy for ferrets. Besides, this is a treat, not a basic food, so the fact that it contains fruits, seeds and vegetables should not cause too much concern. High in animal-based protein and fat (44%and 36% respectively). The freeze-dry technology keeps all natural nutrients intact. 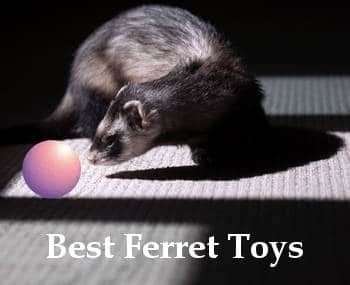 A product of a renowned ferret breeder and food manufacturer. This is an occasional treat that cannot provide a ferret’s daily nutrition. 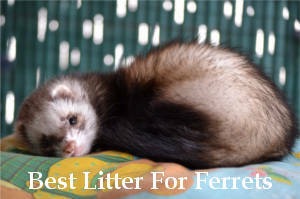 In any case, specialized ferret food is always beneficial for your pet. Today the market of specialized pet food can offer high-quality dry kibbles and treats for ferrets. For instance, you can try Wysong Ferret Epigen 90 – a high-protein, starch- and grain-free ferret food with probiotics, vitamins, minerals and other essential nutrition supplements. Find here and now for your pet best ferret food. If you decide to feed your ferret cat food, you should choose high-quality kiddle food. Wet cat food is not good for them. First of all, it does not have a proper macronutrient ratio to satisfy your ferret’s dietary needs. Besides, ferrets need constant access to food throughout a day and wet food might do bad very quickly if left unrefrigerated. Finally, wet cat food is rather soft and cannot provide sufficient exercise for ferrets’ teeth. Kitten food is even better for ferrets than cat food. The former usually contains more proteins and less carbohydrates. Needless to say, you should choose only high-quality specialized kitten food. It is highly recommended to avoid giving dog food to ferrets. It is not suitable for their digestive tracts and can cause health problems. Look for the proper macronutrient ratio. Both cats and ferrets are carnivores, but cat diet has evolved in such a way that they can consume fruits, vegetables, and seeds. The same can hardly be said about ferrets. Although some quantities of plant-based food can be present in their daily rations, the core of their diet should consist of animal proteins. So if you buy cat food for a ferret, you should adhere to the following nutrition content: no less than 36% of proteins, no less than 18% of fat and no more than 3% of fibers. Make sure it is dry kibble food. Wet cat food is ill-fitted for ferrets, so you should stick to dry food. 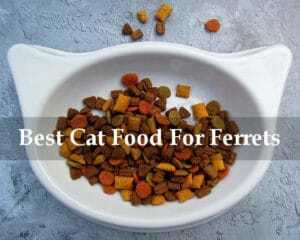 You can also indulge your ferret with occasional freeze-dried treats that are suitable for cats and ferrets. “Can I feed my ferret cat food?” is one of the most common questions among new ferret owners. Hopefully, this article has made the answer clear to you. 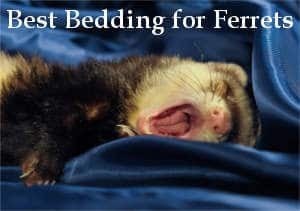 By following these simple rules you can ensure that your ferrets stay healthy even if you are temporarily unable to provide them with specialized ferret food. I loved this post! I read your blog fairly often and you’re always coming out with some with some great stuff. Wow! I had no idea that my ferret could eat cat food. It’s somewhat hard to find ferret food where I am as there is only one local pet store. Although, I can pretty much find cat food everywhere, so it may be a good option to switch my ferret to cat food. For those of you that are trying to decide what type of cat food to get for your ferret… I’ve always been a fan of Wellness products. The company makes excellent dog food, cat food and everything in between. I’ve been buying their products for a while and nothing else competes. As an alternative, cat food, of course suitable. On the other hand, it is still recommended to purchase specialized feed. Which intended, precisely for feeding ferrets. From everything you’ve said above it sounds like ferrets should only be given carbohydrates and fats. Does this mean that if I go to the store and pickup fatty foods for humans my ferret could eat it as well?